Faerie comics that use characters from Shakespeare A Midsummer Night’s Dream are apparently all the rage right now. 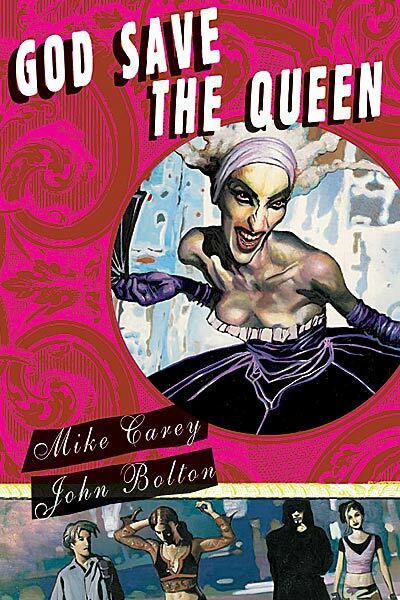 I suppose we did sort of seek out God Save the Queen after Jason mentioned it at some point in a discussion we had about Suburban Glamour, but these two comics were pretty damn similar. They both have Titania as one of the main characters, and they both go into details about how she’s been usurped by another Faerie as queen, and they both have a female “changeling” character, (essentially, a faerie baby who is exchanged for a human baby at birth), and they both involve the changeling finding out who she really is in the course of the comic. Lots of parallels. God Save the Queen had really amazing artwork. I don’t think I ended up liking the story quite as much as Suburban Glamour. Even though Suburban Glamour had more plot holes and weird leaps of logic, it still felt like the characters were more believable. I guess I wasn’t into the dynamic of the drugged out girl and her childhood buddy who just went along with doing hard drugs just to watch over her. It’s probably realistic, but that guy should have grown some balls and put his foot down and said “I’m not joining you in your descent into drug-addicted stupidity” long before the conclusion of that particular plotline. God Save the Queen also felt a little disjointed for my tastes. On one hand we had the plot with faerie characters and concepts, and then on the other the plot where there’s a teenage girl getting high and acting out because her father left and her mother is a total wreck. They worked together okay in principal, but I felt differently about the girl in both… liking her in the faerie one, and hating her in the other. It didn’t make for a book that I could empathize with at all, which was sort of the opposite of Suburban Glamour. All this having been said, it was definitely worth a read for the terrifically beautiful artwork. 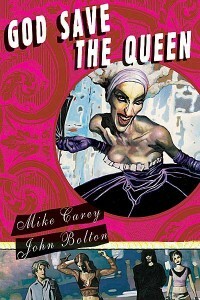 This entry was posted by Martin	on Friday, June 20th, 2008 at 8:23 am and is filed under TPBs/graphic novels, Vertigo. You can follow any responses to this entry through the RSS 2.0 feed. You can leave a response, or trackback from your own site.